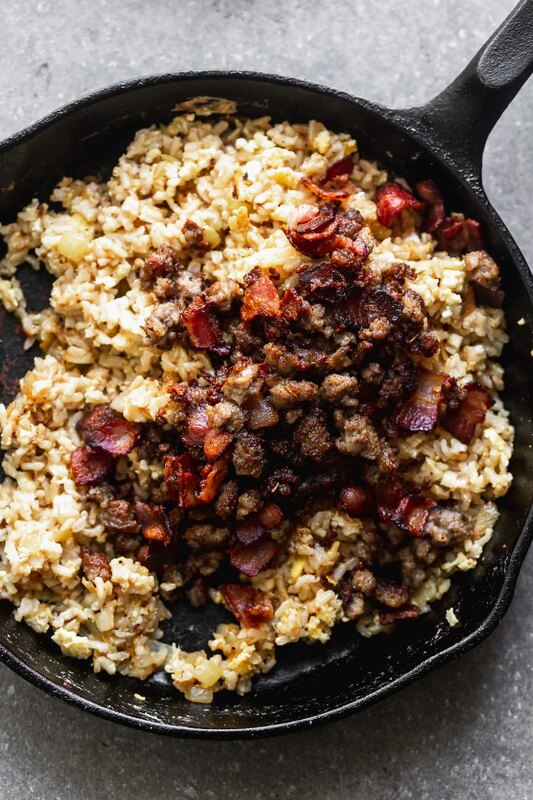 This Breakfast Fried Rice Recipe is packed with salty bacon and sausage, a light soy sauce, and plenty of hearty scrambled eggs. While it’s namesake is technically geared towards breakfast, it’s also perfect for lunch or dinner! Fried rice is such an easy way to get a meal on the table FAST. 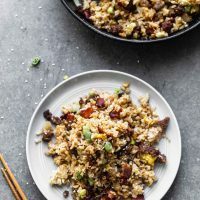 Luckily, we have a whole archive full of other fried rice recipes, so be sure to check out this Quinoa Fried Rice (Pinned MILLIONS of times! ), this Copycat Kona Grill Fried Rice, and this Healthy Broccoli Fried Rice. 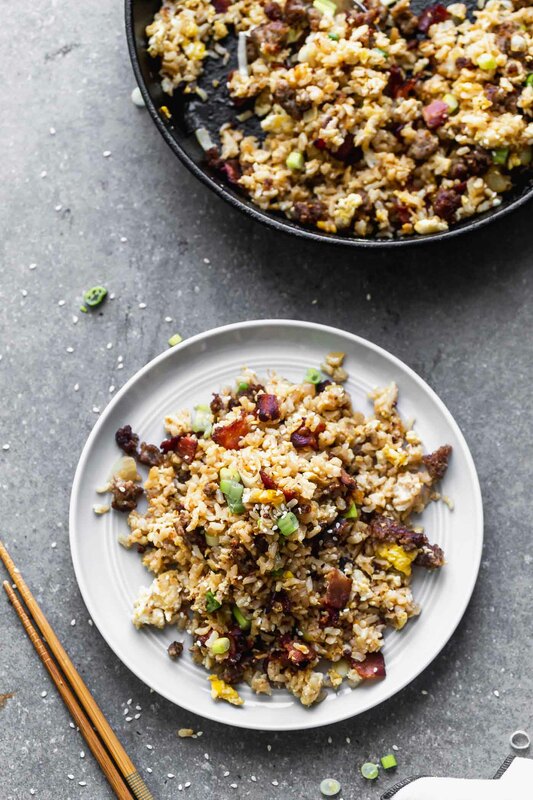 So I’m not really a breakfast for dinner, or dinner for breakfast kind of gal, but when it comes to this Breakfast Fried Rice, I’m all about it. 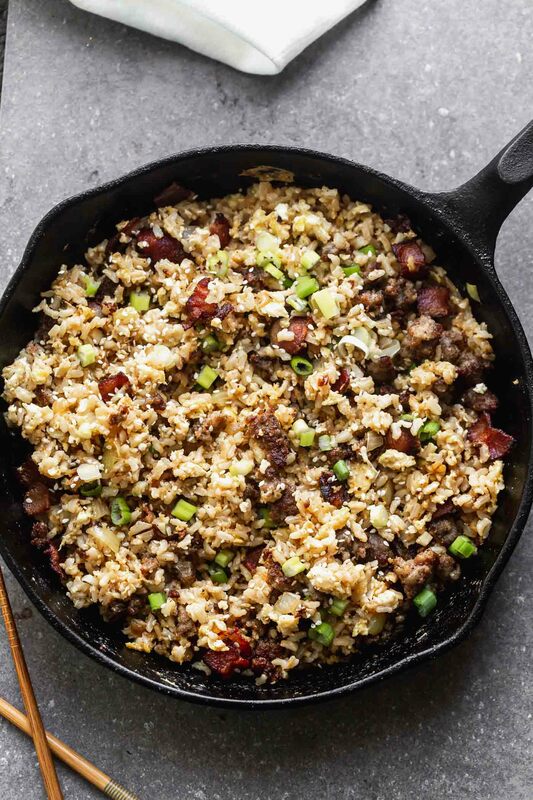 Because when salty bits of bacon and sausage are intertwined with chewy grains of brown rice, scrambled eggs, and just a hint of soy and sesame, well, how could you not want to eat that any time of day?? Also, this recipe is for EVERYONE. Seasoned cooks. Novice cooks. People who like to cook. People who don’t like to cook. Why? Because it’s easy, uses familiar ingredients, and takes basically no time to throw together. brown rice – cooked or uncooked. I cooked mine, but you could really skip a step and just buy brown rice from the Chinese counter at your grocery store. scallions: I like LOTS of scallions. They add flavor, texture, and color, which I love. Chill the rice. I feel that fried rice always turns out best when it’s cold, so make sure to chill the rice before cooking it. Sometimes, if I’m in a hurry and my rice is hot, I’ll even pop it into the freezer and stir it every few minutes to cook it down super quickly. Cook the bacon and sausage. You want the sausage nice and brown, and the bacon crispy, obviously. 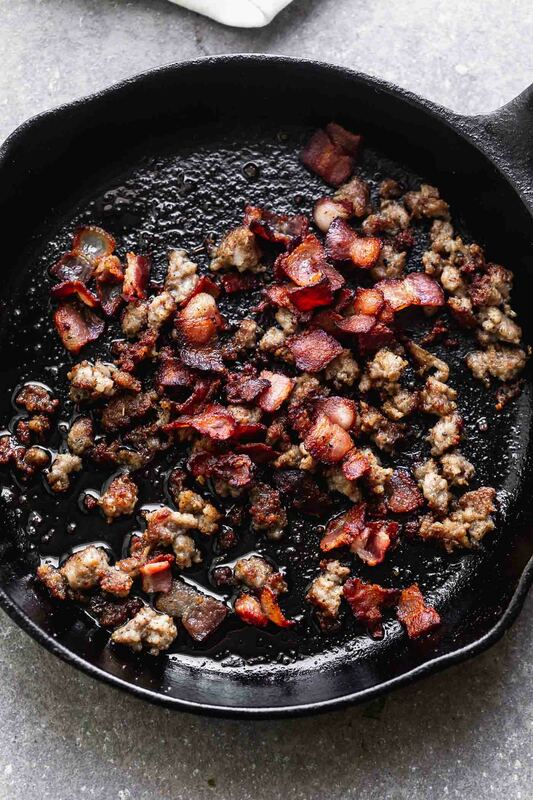 Use a slotted spoon to remove the bacon and sausage and set aside while you cook everything else. I like to cook everything separately so each component stays nice and crisp. Cook the onion, garlic, and scallions. I use the reserved bacon and sausage grease to cook the rest of the ingredients. It adds an extra layer of flavor, and obviously omits the need to add an extra ingredient. Fry the rice. Use a little bit more of the reserved oil to “fry” the rice. I get the pan super hot, then add the rice. Add the soy sauce and sesame. Once the rice is toasted, add the soy sauce and sesame oil. Continue to cook until the sauces are evenly distributed across the rice. Fry the eggs. I move the rice to the edges of the pan, then scramble the eggs in the middle. Because the pan is still super hot, the rice on the edges gets crispy while the eggs cook, which I love. Add everything back to the pan and season with salt and pepper. Even thought there’s a lot of salt in the soy sauce, sausage and bacon, it’s still important to taste for seasoning. I always like to add another little bit of salt and a good bit of pepper at the end. Do I have to use brown rice?? No! I just really like the taste and texture of brown rice over white rice. Plus, I love the added healthy benefits of fiber and antioxidants. The only problem is that it takes much longer to cook, so be sure to give yourself about 40 minutes if you are going to use brown rice and cook it yourself. Do I have to use bacon and sausage? Absolutely not. The great thing about this recipe is a lot of the ingredients are totally adaptable. You could swap out turkey sausage, chicken sausage. You could also skip the meat altogether, and add in some peppers, mushrooms, or edamame. 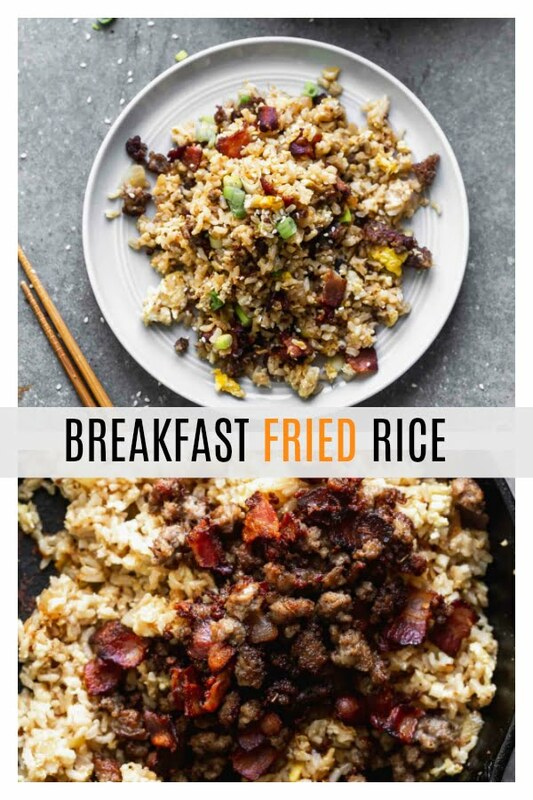 Is Breakfast Fried Rice good leftover?? SO so good. I ate this three days in a row after the initial night. I even ate it cold. I like to use a brown jasmine rice from Trader Joe’s. I always make sure to rinse the rice really well, so it’s nice and fluffy after cooking. As mentioned before, you can also just buy brown rice cooked already. Almost every grocery store these days has a Chinese food counter, so just ask for it there. Make sure you get about four cups. Again, you can swap out the meat. Use turkey sausage, chicken sausage, or pancetta. Swap out the brown rice for quinoa! The trick to good fried rice, is a really hot pan and plenty of oil. If your bacon and sausage don’t render enough fat to cook the onion, garlic and rice, add a little bit of canola oil or more sesame oil. If you really want it heavy on the eggs, add a few more. You can never have too many. 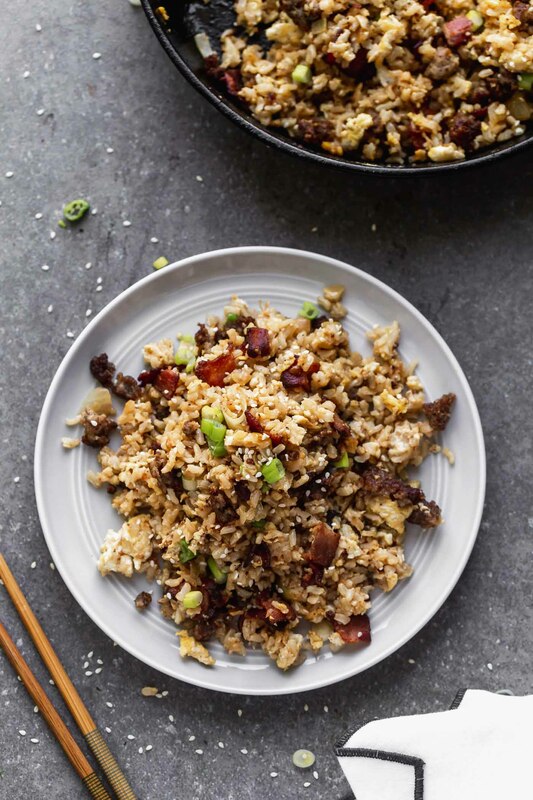 This Breakfast Fried Rice is packed with salty bacon and sausage, a light soy sauce, and plenty of hearty scrambled eggs. While it's namesake is technically geared towards breakfast, it's also perfect for lunch or dinner! If cooking the rice, rinse rice a few times in cold water. Cook according to package directions. Fluff with a fork and spread on to a baking sheet. Place in the fridge until chilled, about 10 minutes. If you're using cooked rice already, make sure the rice is cold. Heat a large non-stick skillet to a medium-high heat. Add bacon and sausage. Cook until sausage is brown, and bacon is crispy, about 10 minutes. Make sure to use a wooden spoon to break the sausage into small pieces. Use a slotted spoon to remove the bacon and sausage. Set aside. Remove all but one tablespoon of the grease, reserve the rest. Reduce the heat to medium and add the onion, cook until softened, about 3-4 minutes. Add the garlic and half of the scallions, cook another 1-2 minutes until the garlic is fragrant, be sure to keep the garlic from burning. Add reserved grease back to the pan (you should have about a tablespoon, if you don't, you can use canola oil). Turn the heat back up medium-high and add cooled rice. Toss the rice with a wooden spoon and cook 1-2 minutes until the grease has coated the rice. Add soy sauce and sesame oil. Keep tossing the rice until evenly coated, another 1-2 minutes. Add bacon and sausage back to the rice, toss until combined. Add sesame seeds. Toss. Season to taste with salt and pepper. Garnish with remaining scallions.